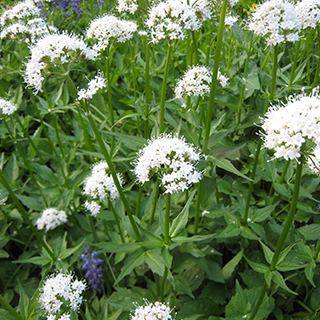 Sometimes described as "nature's tranquilliser", valerian originates in temperate areas from Europe to Japan. It has been extensively researched in recent years. Chemicals called valepotriates, which seem to have a depressant effect on the nervous system, are now known to develop in extracts and the dried plant. Valerian is a sedative and also helps induce sleep; the fresh plant is more sedating. The herb can reduce stress, nervousness and irritability. Valerian root is best made into a maceration rather than a decoction. Soak scant 1oz (25g) of the chopped, preferably fresh, root for 8–10 hours in 1 pint (600ml) of cold water. Take 1 cup up to 3 times daily for anxiety, nervous tension, or high blood pressure linked to stress. Take a cup before bed for insomnia. The ground root may be added to capsules (also commercially available). Take 20 drops–1 tsp (1–5ml) up to 3 times daily for nervous problems. Dosage can vary considerably between individuals, with higher doses causing headaches in some, so start with low doses. Soak a pad in a cup of maceration or the diluted tincture and apply to muscle cramps or the abdomen for period pain and colic. Prefers moist soil in a sunny or partially shaded area; suitable for a woodland garden. Sow seeds in a cold frame in spring, transplant to pots, and plant out when established, or propagate by root division in spring or autumn. Dig roots and rhizomes of plants that are at least 2 years old in autumn.